In the small village of Izbet Tabib near Qalqiliya in the north of the West Bank, 27 of the 55 houses have received eviction orders from Israeli authorities. Located in Area C (following the Oslo Accords making it Israeli civilian and militarily controlled), the village has an extremely hard time getting building permits. 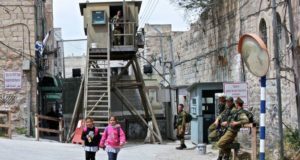 Furthermore as it is situated near both the annexation wall and several illegal settlements, villagers experiences daily harassment and constant tension. 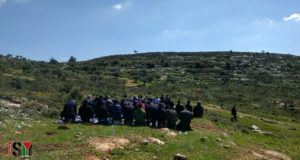 The wall has annexed large parts of Izbet Tabib’s farm land, and extremist Israeli settlers are in the habit of driving through the village and harassing the inhabitants by shooting in the air or setting olive trees on fire. Also, the Israeli Occupation Forces are almost always present, creating additional trouble and fear for the village. 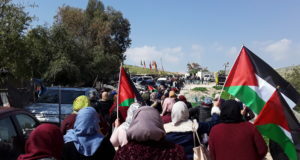 The Popular Committee and others attempting to resist the occupation are especially targeted by the Israeli authorities in an attempt to repress this resistance. A case in point is that of the Mayor and Head of the Popular Committee, Bayian Tabib. He and his fifteen-year-old son, Thair Bayain Tabib, were arrested on Friday the 30th of July around 2 p.m. as they stepped out of the mosque after the Friday noon prayer. Both were accused of throwing stones at a main road near the settlement – both declared themselves innocent. Regardless of the complete lack of evidence, Israeli soldiers, after having detained the two men for about an hour, put them in a jeep and drove them to a secluded place slightly outside of the village. Here, the commander in charge demanded that Bayain Tabib keep the youngsters of the village completely away from the main road and threatened him with further arrests if he didn’t obey. The soldiers seized the identity cards of the two men unlawfully and finally released them after one hour and a half. Episodes like this are not exceptional. Thair Tabib has been arrested a number of times, the first when he was thirteen years old, and is always accused of stone-throwing. His father, Bayain Tabib, was in prison for two months in 2002 during the second Intifada. As the head of the Popular Committee, Tabib receives special attention from the Israeli authorities. Israeli soldiers often park outside his home and point their machine guns at anyone coming or going in an attempt to intimidate Tabib, his wife, and his nine children. The latest threat is to three shops in the village which were partially demolished on August 12th by a bulldozer owned by a private Israeli gas company, Delek. The firm wants to build a new gas station in the area for the roughly 5,000 Israeli settlers from Zufin and the many more who inhabit Alfei Menashe, the biggest illegal settlement nearby, as at present the only one nearby is Palestinian. The land was sold to them by a Palestinian collaborator with Israeli ID but the shopkeepers are resisting the demolition of their shops which would destroy their livelihood. ISM activists will be staying overnight together with the Mayor and owners of the shops in case a demolition bulldozer returns – they have come on the three previous Thursdays and are expected again this Thursday. According to the villagers court has issued a demolition order on the shops. Meanwhile, despite the great pressure that Izbet Tabib is exposed to from both soldiers, settlers, the wall, eviction and demolition orders, the village has become an important and inspiring site for resistance against the occupation. What is particularly unique is that Izbet Tabib joins an extremely small number of villages that have succeeded in having the wall that used to cut deeply into their farm land physically removed and thus getting most of their stolen farm land back after a verdict that declared the original route of the wall illegal.